Legal method to get YouTube automated subscriber for your YouTube channel. This is latest update to our earlier post on Grow your YouTube channel automatically, even if you sleep. This is a method whichis licensed under the latest Creative Commons Attribution 3.0 License and 100% legal as confirmed by Google team. 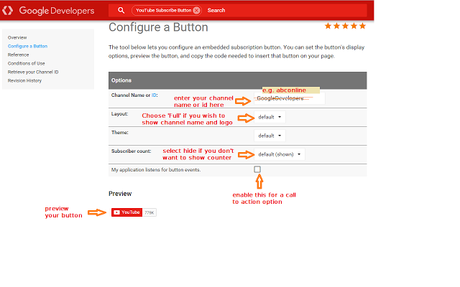 Step 1:First you need to go to YouTube's configure a YouTube subscription button page at Google developers site. Step 2:Get your YouTube channel id here. Copy the channel ID (not user ID) and paste it. Customize the button's look and feel. Copy the code and paste at a desired location.